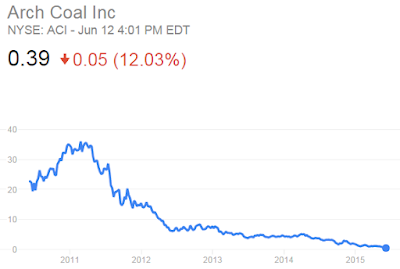 Coal prices in the US are collapsing. 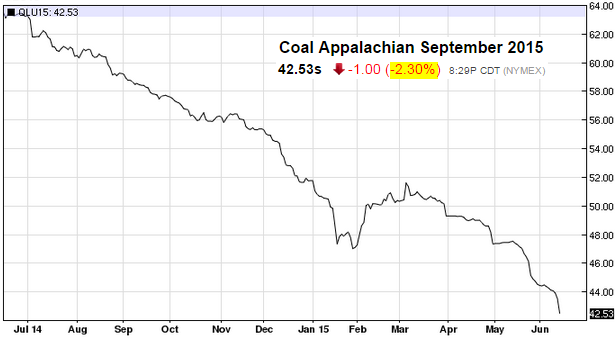 The September Appalachian coal futures contract gave up over 2% on Friday as the industry faces unprecedented challenges. One can see the decline in the industry's activity levels by tracking rail shipments of coal. Railcar loadings are now at the lowest level in decades. EIA expects a 7% decrease in coal consumption in the electric power sector in 2015, despite a 1% increase in total electric power generation. 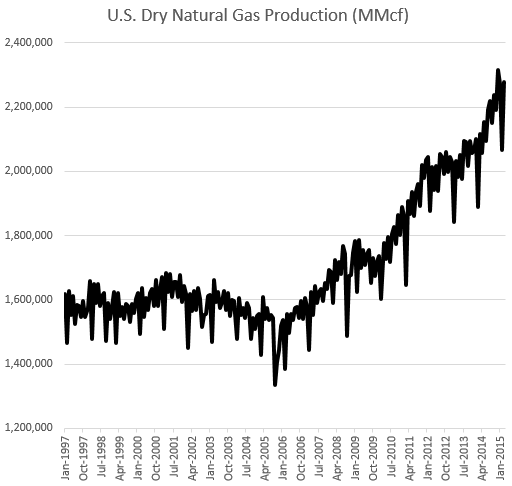 Lower natural gas prices are the main driver of the decline. Projected low natural gas prices make it more economical to run natural gas-fired generating units at higher utilization rates even in regions of the country (Midwest, South) that typically rely more heavily on coal-fired generation. Increased generation from wind, solar, and biomass is also expected to displace coal-fired generation, as several facilities have been converted from coal-burning facilities. 2. New EPA regulation, particularly the Mercury and Air Toxics Standards (MATS), is pressuring electricity producers to retire some coal power plants. PLATTS: - Appalachian Power said this week the cost to upgrade coal-fired units at four power plants in Virginia and West Virginia that were retired in May would have been so high it did not even compile cost estimates for the work. In a report filed earlier this week with the West Virginia Public Service Commission further explaining why the Clinch River and Glen Lyn power plants in Virginia and the Kanawha River and Philip Sporn power plants in West Virginia were retired, APCo said it "has not performed any detailed cost estimates because the order of magnitude of the costs was so tremendous." 3. Global coal demand has fallen off sharply, driven largely (but not entirely) by China. The Sydney Morning Herald: China's coal imports slumped 41 per cent in May from a year earlier to 14.25 million tonnes and were down sharply on April despite industry expectations of a pick-up in seasonal demand, data showed on Monday. 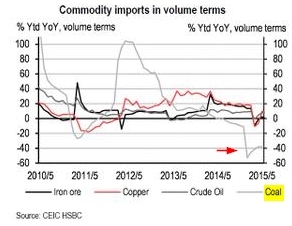 Total imports in the first five months of the year reached 83.26 million tonnes, down 38.2 per cent compared with the previous year, according to preliminary data from China's General Administration of Customs. May's imports were down 28.6 per cent on April, according to the data, while Reuters calculations showed that imports were down 40.6 per cent compared to May 2014. Imports normally improve over the northern summer, but analysts said any upturn would be limited despite relatively low inventory levels at thermal power plants, with hydropower likely to meet a large share of the increase in power demand. "Imports are constantly decreasing compared to last year due to new policies, and the use of new (renewable) energy," said Zheng Nan, an analyst with China's Shenyin Wanguo Securities. 4. To make matters worse for the industry, the state of Wyoming is reviewing the balance sheets of some major coal producers. The law requires coal firms to carry insurance that would provide environmental cleanup resources should the firms fail. But with the latest price pressures, some firms may not qualify for such programs and would be forced to maintain collateral. In the current environment these firms may not have the resources for these new requirements. Bloomberg: - The Wyoming Department of Environmental Quality’s Land Quality Division is reviewing 2014 financial data from Peabody and Arch to see if they still qualify for a “self-bonding” program that allows coal producers to cheaply insure their clean-up costs in case of bankruptcy, Kimber Wichmann, an economist at the department, said in a phone interview. Miners that fail to meet certain financial benchmarks must buy instruments that include corporate surety bonds and Treasury bills, or hold enough cash, to cover potential reclamation liabilities. 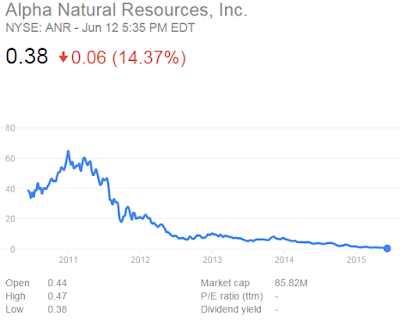 Shares of some large coal producers are hitting record lows. 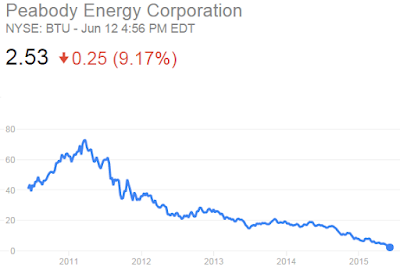 To be sure, coal will remain a major source of electricity production in the United States. 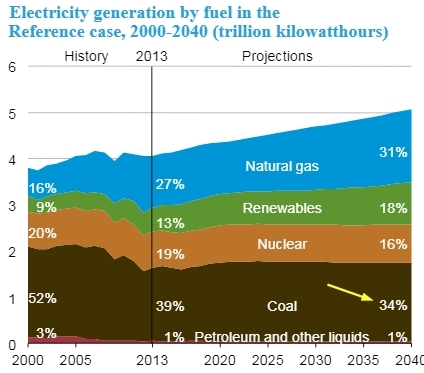 Even if the EIA projection (chart below) is too optimistic on the future of coal usage, the survivors of the "coal crunch" stand to profit handsomely. 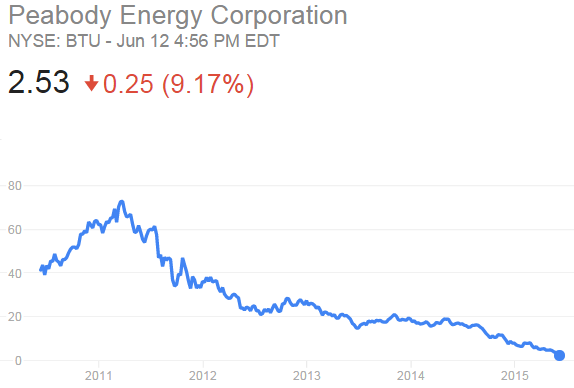 Moreover, some diversified energy firms are still making money on coal even at these prices. Nevertheless, the industry is undergoing a historic shakeup, which a number of industry participants (particularly those who are highly leveraged) may not survive. Many thanks to Greg Merrill for a helpful discussion on the topic.